Professional fitness instructors always emphasize the importance of climbing the stairs as opposed to taking the lift. Unfortunately, not many people find the time to do so. How can one get the benefits of stair climbing? A mini stepper is an appropriate way of giving the body an effective cardio workout while toning the calves and the thighs. It is small and portable yet quite powerful. Due to the growing popularity of this gadget, it may be difficult to choose the ideal one. This article seeks to explore the best mini stepper models there are with an aim to assist individuals in discovering the ideal gadget that fits their requirements. What are some of the Mini Stepper Exercise benefits? There are different factors to consider before settling on a particular mini stair stepper. These gadgets are differently priced depending on their functionality and quality. Individuals looking to purchase them can use the following factors as a guide in order to avoid making wrong choices. Materials: The best mini stair stepper should be durable and strong enough. Ensure the pedals are made from a comfortable material which is gentle on the feet. Even though plastic would be ideal, it should only be used to shield a stronger material within. Remember the pedals should be sturdy enough to withstand body weight. The other parts of this gadget should be made of a strong material such as steel, alloy, or metal. Size: Mini steppers come in different sizes. The best gadget should be able to cater to an individual's needs regardless of where they plan to use it. Many of these gadgets are small and can be used in the office, on the balcony, or at home. Additionally, one may want to ensure that it is not too heavy since a heavy gadget makes it difficult to carry around. Sound: The convenience of this gadget allows individuals to utilize it anywhere. They can even choose to exercise at the wee hours of the night. Of course, no one would want to purchase a noisy gadget that disturbs people while they sleep or during office hours. Some users found that particular models became noisier with continued use. Choose a model that has been proven to produce minimum to no noise at all. Pedals: Considering that the pedals play one of the most important roles in this gadget, ensure to check whether they are the correct size. One can do this by placing their feet on the pedals. Additionally, they should have a sturdy grip to ensure that users do not trip and eventually suffer injuries. Resistance: An ideal mini stepper should have a flexible resistance. This may not be of much importance if one is a beginner. However, as they progress and master how to use this gadget, they definitely would need a gadget that is flexible enough to modify the resistance. Progress: There is so much fun and fulfillment in being able to notice workout progress. A good mini stepper is fully computerized with a screen to indicate the individual’s progress. Users want to know how much calories they have lost, the distance covered while exercising, and the time they have spent. The Xiser Commercial Mini Stairmaster is made of cast airframe grade alloy. These materials are commonly used to make some parts of an airplane. Perhaps that should depict just how strong and durable this gadget is. Surprisingly, it weighs only 14lbs and can be used by people weighing up to a maximum of 400 pounds. This gadget features textured pedals for comfort and safety during workouts. It comes with an adjustable resistance which is powered by a hydraulic cylinder system. The performance of this gadget is aligned to an individual’s exercise ability, level, and efforts. Its resistance allows one to either choose to sprint or do slow exercises. Users are assured of a silent workout since the gadget comes complete with silicon fluid to enhance a quiet and smooth exercise. The Xiser Commercial Mini Stairmaster has been rated as the best gadget that allows for both stepping and sprinting exercises. The alloy material used to construct this gadget is strong and durable yet light and portable. It can withstand up to 400 pounds. It does not make noise whether individuals decide to sprint or go slow in their exercises. Individuals can come up with a mini stepper workout which may include CrossFit, spinning, tension, and even dancing exercises. According to some reviews, may people found this gadget a little expensive. They were also worried because it lacks a computerized system to help them monitor their progress. Nevertheless, many of those who were able to afford it reported remarkable progress. Regardless of the above concerns, the mini stepper benefits proved to be quite effective. The j/fit Mini Elliptical Stepper comes with unique characteristics which make it different from other models. Fitted with adjustable pedals, this gadget is convenient for use both while seated and standing. It is movable and small such that one can easily fit it under a normal office desk. It comes with a handle at the top for convenience while carrying. Beginners can utilize the front handle for support during stepper exercises at home. The display on this gadget is an added advantage. Individuals can monitor their progress in terms of calories lost, time spent, speed, and distance covered. The gadget comes with huge roller wheels which minimize its depreciation while enhancing easy movement. These wheels also play a big role in making the workout silent and smooth. This gadget is by far the best stepper machine for home. Users can utilize the tension dial to either lower or increase resistance. It comes with sturdy pedals and is made from very high-quality materials. It is adjustable and has a display screen for monitoring workout progress. Exercising using this gadget does not cause disturbance to other people because it makes no noise. It has a unique design that allows users to use it in different positions. It may be a bit huge and heavy. Some user reviews indicated that some gadgets needed regular oiling to prevent squeaking. The Stamina In-Motion Elliptical Trainer is strong and can be used while seated or standing. It has been designed to allow both backward and forward movement to ensure that the legs are given a total workout. This gadget is fitted with a fitness meter right between the pedals to track distance covered, time spent, the mini stepper calories burned, and the number of strides taken. The foot pedals are textured to give them a firm grip, and it also features a low impact layout to protect the knees, ankles, back, and knees from injury. It is made from a strong steel material for durability. This gadget is ideal for both elites and beginners since it has an adjustable tension and resistance. The good thing about this gadget is that the resistance can be manually adjusted by simply turning a knob to the desired level. The versatility of this gadget is impressive. It is small and portable which makes it ideal for use within limited spaces. It is made of strong materials which guarantee durability. It is versatile seeing that it can be used in different ways. The display screen allows individuals to monitor their progress. The Sunny Health & Fitness Twister Stepper is versatile, compact, and portable. It comes with inbuilt resistance training. It is made of a sturdy steel material which makes it durable. It features the twist action which is responsible for taking one through a vigorous cardiovascular workout while toning the buttocks and the thighs. This technique exercises the deep areas within the muscles without exerting pressure on the joints. This mini stepper features huge and textured foot pedals for extra grip and comfort during exercise. They also protect users against slipping and falling off the gadget. An inbuilt LCD display ensures users can monitor their progress in calories burned, time taken, and the total rep count. This gadget has an adjustable resistance and comes with arm exercise bands which reinforce the workout. This ensures a full body workout. This gadget provides the body core with a total workout. It is durable and comes with a display screen. According to some user reviews, this gadget can be a little noisy sometimes. It is also limited to support a maximum of 250 pounds which restricts heavier people from using it. The Gold's Gym Mini Stepper is versatile, compact and easy to store. It is ideal for people with limited spaces. It comes with an LCD monitor screen to track the user's steps taken, calories burned, and distance covered during the workout. This gadget is specially designed to exercise the thighs, glutes, and calves. The leg muscles also benefit immensely from this mini stepper. Textured foot pads enhance grip and reduce chances of slip and injury. This gadget is reasonably priced. It is portable and lightweight, therefore, individuals can carry it to various places. Heavy people may not be able to use this gadget since it is limited to withstand only 250 pounds. Some reviews indicated that it was squeaky. Confirm whether the mini stepper is well set up. Put it on a flat surface and press the power button (if it has one) to turn it on. Depending on the gadget's model, users may be required to select what to display on the screen. Always perform a warm up exercise to prepare the body for the impending workouts. Start by moderately walking in stationary motion for around 10 minutes or until a light sweat breaks. Next, do vigorous but stationary stretches. These include swinging the legs back and forth and moving the arms in circular motion. Perhaps one may ask themselves how to use a mini stepper with resistance bands. Hold the resistance grips and step on the gadget with each foot on the respective foot pedal, relax the arms so as to fully concentrate on the leg movement. Allow one foot to step down. This automatically moves the other foot upward. Allow the top foot to reach the end of the movement. Now move the top foot downwards. This allows the other foot to move upwards. Repeat this process until completion. Remember always to start exercises gradually and increase the speed on the go. A mini stepper is a compact device which can be used by people who have limited time to go to the gym. It is convenient and versatile which makes it easy to carry around and use. These gadgets are usually foot exercise equipment which enables individuals to exercise through stepping on them against resistance. 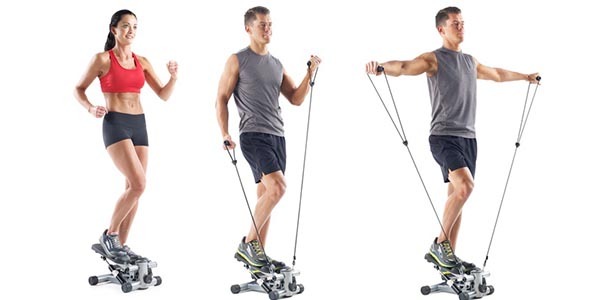 There are various exercises that one can do on a mini stepper. Many of these workouts enhance cardiovascular health. For example, the stepping action used when exercising on this gadget characterizes stair climbing. Doing these exercises on a mini stepper regularly provides individuals with numerous cardiovascular benefits. In order to reap these benefits, one should strive to exercise for 150 minutes per week. Users can choose to exercise every day for not shorter than 10 minutes. Individuals who want to tone up their muscles will be delighted to know that this gadget uses the same muscles used for climbing stairs. Using a mini stepper tones the lower body section which includes the quadriceps, hamstrings, calf, and glutes. Apart from toning the muscles, this gadget enhances muscle endurance with each exercise. The more regular one does the exercises, the better the results. An ideal mini stepper exercise routine enables one to burn calories and eventually lose weight. Beginners may not be able to notice any changes even after weeks of using this gadget. 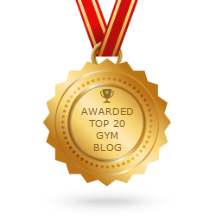 This is attributed to the fact that exercises done on a mini stepper are gradual and, therefore, do not allow individuals to burn a lot of calories. However, regular exercises increase resting metabolic rate hence burning more calories. Both the stepper machine and the elliptical are vital for burning calories, improving cardiovascular health, and toning the muscles. However, they vary in their effectiveness. For instance, the elliptical is more effective when it comes to burning calories. Both the elliptical and the mini stepper workout the lower body muscles using different techniques due to their varying designs. The ideal mini stepper should be convenient and portable to enable individuals to exercise from anywhere. The above review can help one find the best gadget that fits their needs and routine. Mini stepper before and after results can be noticed after consistent workouts. Remember warm-up exercises are essential in preparing the body for more strenuous workouts. Beginners should be moderate with their exercises and consult an experienced fitness instructor when they need assistance.